Here’s a helpful tip: timers only work when you set them. If, instead of setting a timer, you just leave the kitchen and sit down at your desk and start working on the computer while waiting to be prompted by the sound of a timer going off, it’s very likely that you will work too long while your pasta turns to paste. You’re welcome. 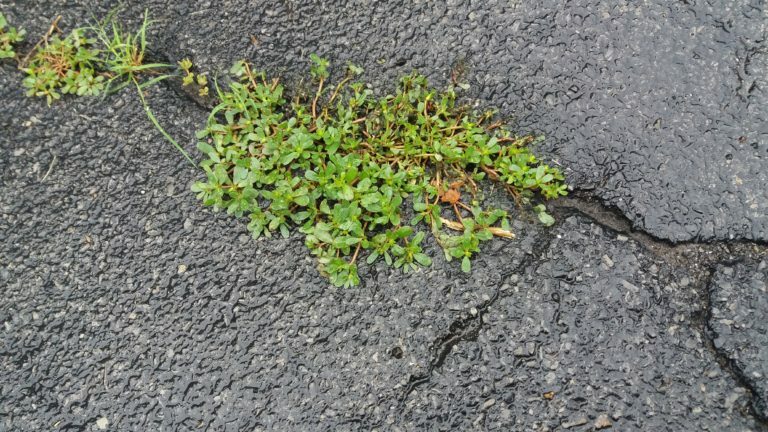 Here’s another tip: if you are overdue for resealing your driveway, it’s entirely possible that you’ll find yourself harvesting purslane. This delightful weed is a lovely addition to salads, and it’s super-duper vitamin-packed. Also, I don’t have the exact numbers, here, but it is absolutely cheaper to rip it out of your driveway than it is to purchase this item from the organic section of Whole Foods. 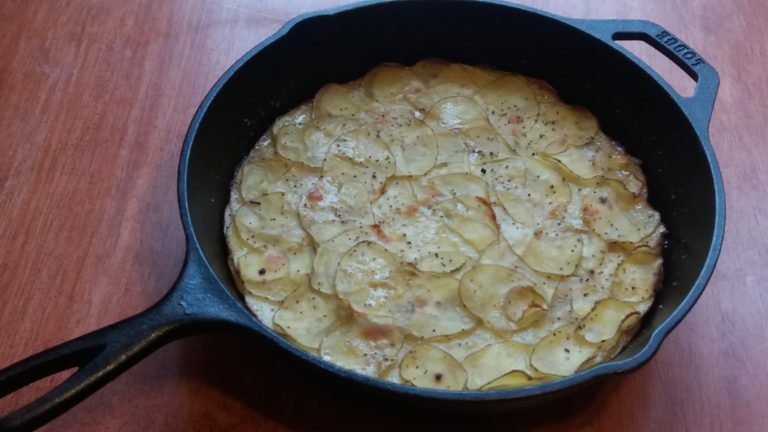 Here’s our latest favorite way to do potatoes. I cut them into thin rounds with the little mini mandolin that we have, then place a bunch of layers in a pan with slightly too much butter and some salt & pepper, then cook them — umm, I totally don’t remember, but it’s not all that long, maybe 25 minutes in a 400 degree oven? They are lovely and delicious. We just got finished hosting Grandma and Grandpa for a completely action-packed weekend. On Friday, we went to M’s first sectional soccer game, then followed it up with a volleyball game with J. On Saturday, we were out of the house by 7:30 am for an all-day volleyball tournament that really went all day, since the girls made it to finals and then turned the last game into a nail-biter. It’s best of three, but each team won a game, so we went to the third game and then one team would score and then the other team would tie it up repeatedly. They finally managed to come out on top, and after massive cheers and a few pictures, everyone scattered, since the entire rest of J’s team (besides J) is in high school, the homecoming dance was that night. We raced home, as well, to bring M to her designated meeting spot for tons of photos before heading off to the dance with a gaggle of girlfriends. On Monday, J had her last volleyball game of the season. She’s really sad it’s over. She had so much fun and she loves her teammates, none of whom she’ll see at school. And today, we’re heading out to see M and her teammates play in the section semi-finals against Shen. That will be a tough (and cold!) game. I know that the girls are training hard, but I’m satisfied that I’ve done my part by heroically locating our only white Under Armour shirt, our only acceptable option for keeping our baby from freezing her bippy off. After searching everyone’s bureaus and every spare backpack, I remembered the second closet off of J’s room, where the girls often store extra off-season clothes. And in spite of its ill treatment, the shirt didn’t even smell! So I feel like a champion already. Let’s hope the family’s luck holds. GO Miss M! Time for some flow yoga for Miss J?